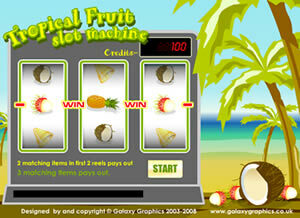 Tropical Fruit Slot machine, a viral Flash game by Galaxy Graphics. Slot machine graphic design Illustration. Tropical fruit slot machine is one of several games of chance available for licence from Galaxy Graphics. This is a simple fruit slot machine - but any aspect of this game could be customised for your site. Graphics, sounds, location.. a customised slot machine might be the thing to keep your site's visitors amused and entertained for while, keeping them on your site and helping to reinforce your brand and products. Other casino/ games of chance available are Scratchcards, Blackjack and the Wheel of fortune. If you are interested in licensing this Fruit Machine game for your own site, please contact us for more information on flash games.